Stories of the journeys of Boys & Girls H.S. in educating, inspiring and empowering young people are often told as a “many-mountains-to-climb” rite of struggle with failure as the operative word. A recent visit to Boys & Girls H.S. offered a glimpse of how the school is on track in developing and actualizing students’ potentials. And where failure is not an option. 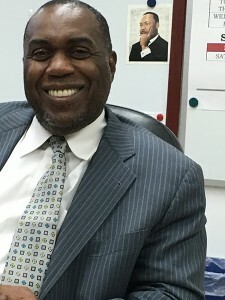 Dr. Michael Wiltshire, Executive Principal Boys & Girls HS; Principal, Medgar Evers College Prep. The guiding hand of Dr. Michael Wiltshire, executive principal of BGHS since October 2014 and principal of Medgar Evers College Preparatory since 2001, is quite evident, and he gives huge credit to his predecessor Bernard Gassaway. In an Our Time Press interview scheduled for placement later this season, Dr. Wiltshire discussed pioneering collaborative ventures between BGHS and Medgar Evers College Prep that benefit both schools. Other innovative programs, projects and resources, as described by Dr. Wiltshire, offer students, particularly at BGHS, solid options for academic fulfillment or career success. Yet, others provide interactive learning opportunities that promote self-enrichment. In fact, an example was shared by the school librarian on the day of our visit. BGHS’ Our Streets, Our Stories digitizing initiative in cooperation with the New York Public Library is inviting students to bring their family photos and share their histories for archiving this March 2016. In coming weeks, Our Time Press will feature success stories on this project and many others in the life of Boys & Girls H.S. Some of these articles will be written by student journalists enrolled in BGHS’ own journalism and media program. The overarching theme of these stories will be how BGHS-initiated programs, supported by community groups, the Department of Education and parents, teachers and school administrators, are all working to keep BGHS moving steadily on course and into the future. Next week, Our Time Press features community leader Al Vann, a former assemblyman, councilman and Boys High School graduate, in an exclusive interview conducted by writer-reporter Akosua Albritton. Previous articleCelebrations for Dr. Martin Luther King, Jr.